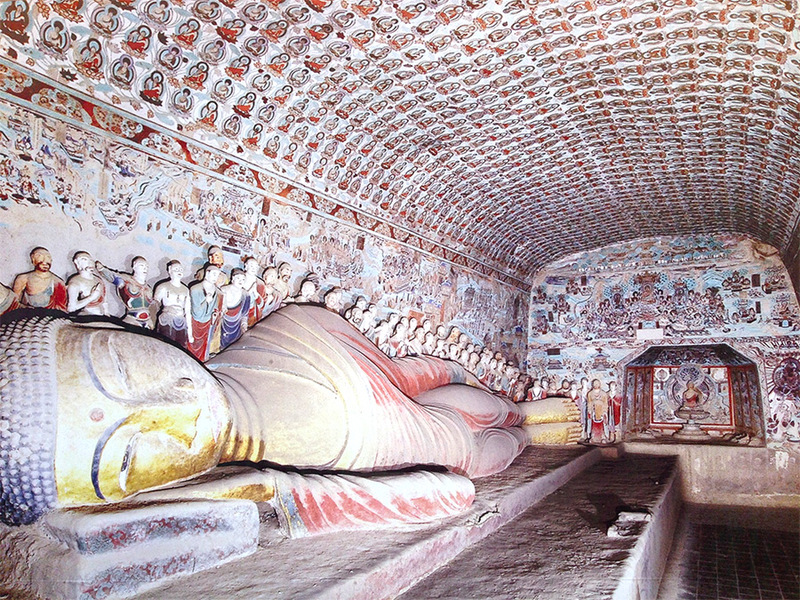 2 The Thousand Buddha Grottoes (千佛洞) form a system of 492 temples 25 km southeast of Dunhuang. 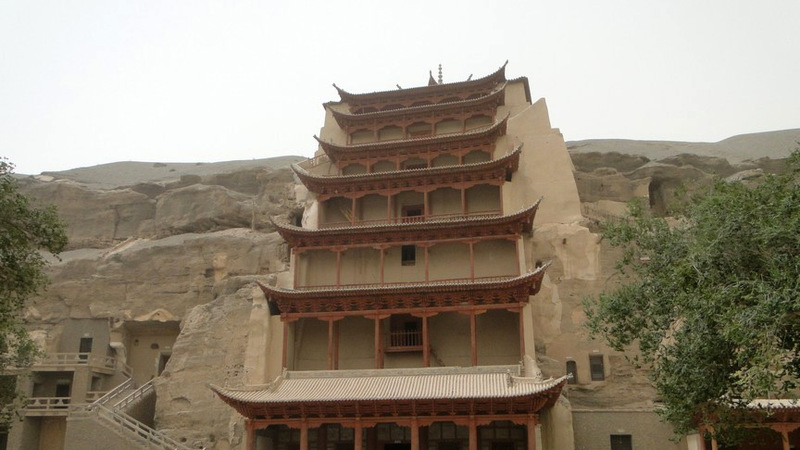 The Thousand Buddha Grottoes (千佛洞) form a system of 492 temples 25 km southeast of Dunhuang. The Mogao Caves along with Longmen Grottoes and Yungang Grottoes are the three famous ancient Buddhist sculptural sites of China. Situated at a strategic point along the Silk Route, at the crossroads of trade as well as religious, cultural and intellectual influences, the 492 cells and cave sanctuaries in Mogao are famous for their statues and wall paintings, spanning 1,000 years of Buddhist art. Carved into the cliffs above the Dachuan River, the Mogao Caves south-east of the Dunhuang oasis, Gansu Province, comprise the largest, most richly endowed, and longest used treasure house of Buddhist art in the world. It was first constructed in 366AD and represents the great achievement of Buddhist art from the 4th to the 14th century. 492 caves are presently preserved, housing about 45,000 square meters of murals and more than 2,000 painted sculptures. 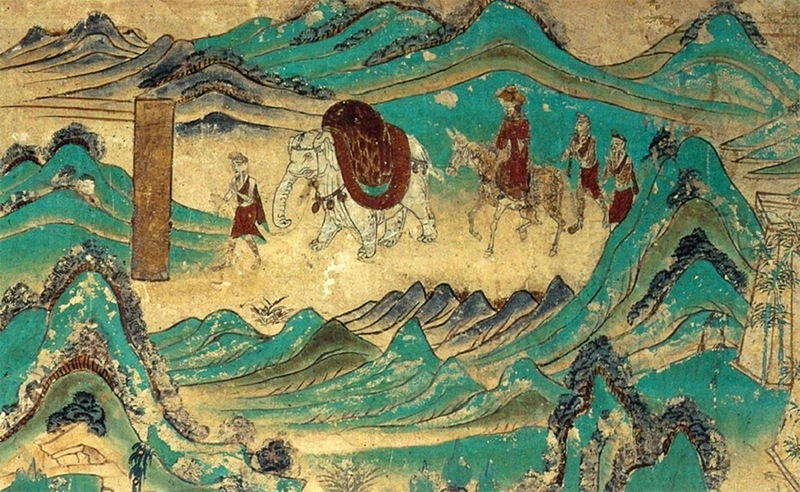 Cave 302 of the Sui dynasty contains one of the oldest and most vivid scenes of cultural exchanges along the Silk Road, depicting a camel pulling a cart typical of trade missions of that period. Caves 23 and 156 of the Tang dynasty show workers in the fields and a line of warriors respectively and in the Song dynasty Cave 61, the celebrated landscape of Mount Wutai is an early example of artistic Chinese cartography, where nothing has been left out – mountains, rivers, cities, temples, roads and caravans are all depicted. 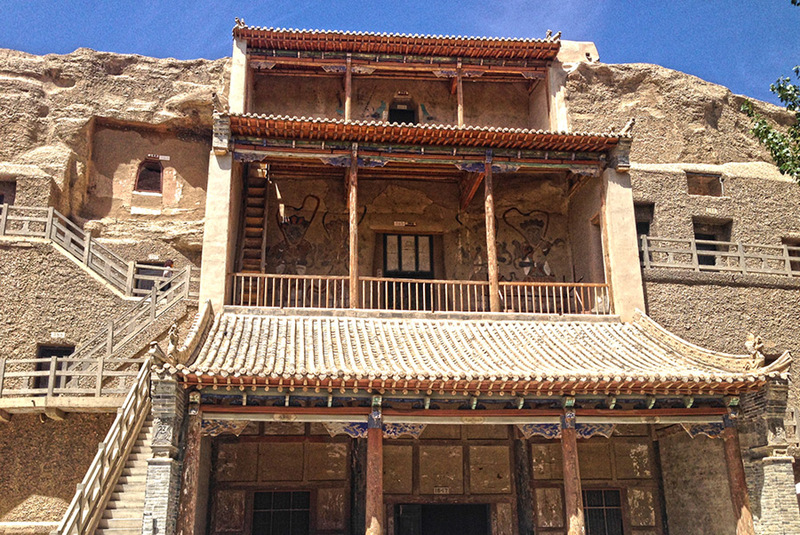 Exterior of the Mogao Caves, Dunhuang, China, including chambers used by monks for living and meditation. As evidence of the evolution of Buddhist art in the northwest region of China, the Mogao Caves are of unmatched historical value. These works provide an abundance of vivid materials depicting various aspects of medieval politics, economics, culture, arts, religion, ethnic relations, and daily dress in western China. 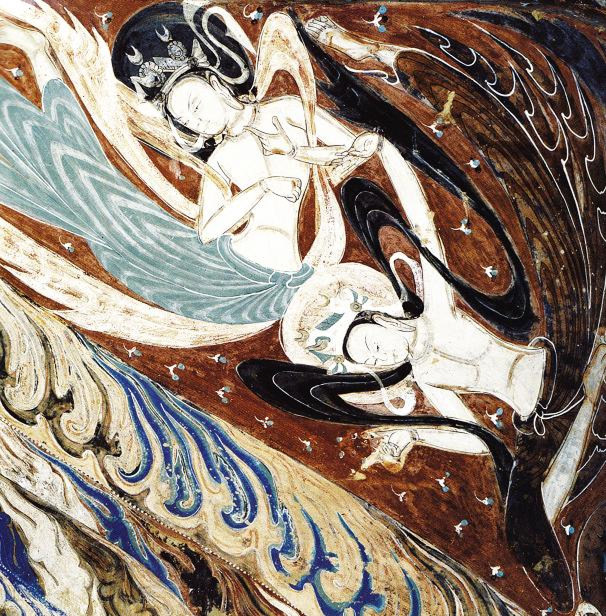 The unique artistic style of Dunhuang art is not only the amalgamation of Han Chinese artistic tradition and styles assimilated from ancient Indian and Gandharan customs, but also an integration of the arts of the Turks, ancient Tibetans and other Chinese ethnic minorities. Many of these masterpieces are creations of an unparalleled aesthetic talent. Mogao Caves encompass caves, wall paintings, painted sculptures, ancient architecture, movable cultural relics and their settings. The property area and buffer zone contain all the attributes that demonstrating the values of the Mogao Caves and thus ensure the integrity of both the heritage site and its environment. 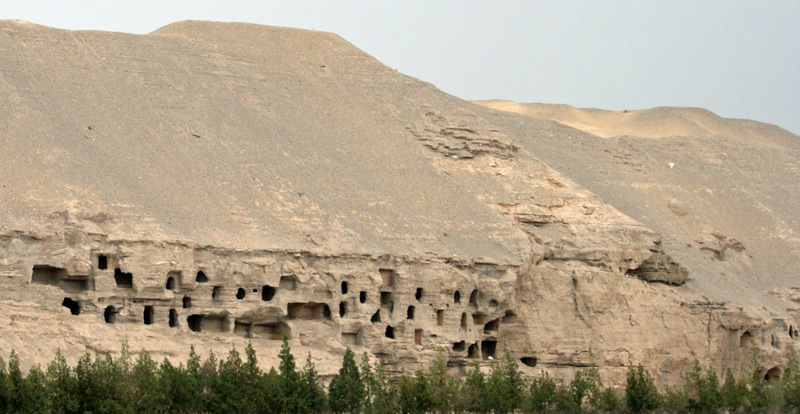 Documents of Western Xia, Central Asian and Phags-pa scripts had been discovered through archaeological investigations in the 243 caves in the northern area of Mogao Caves, which was the area for monks to live and meditate and also served as the graveyard in the past. 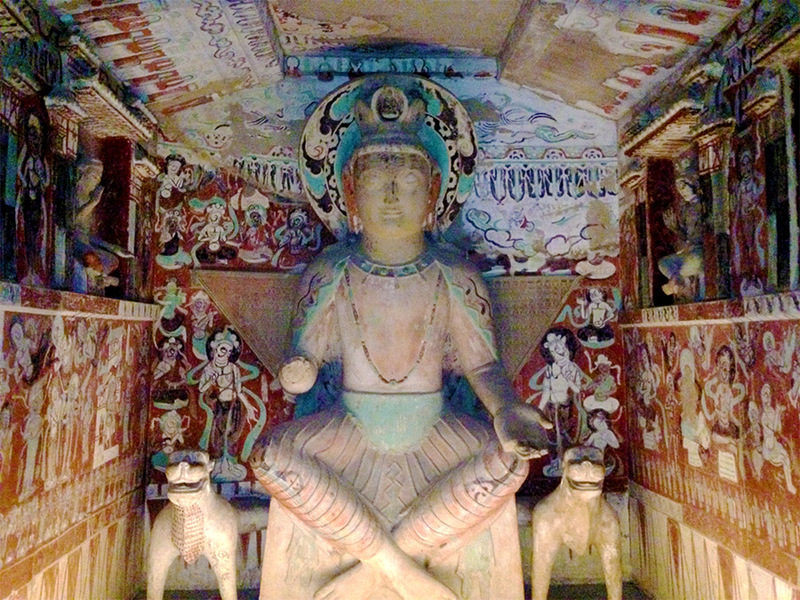 The Mogao Caves comprise the Northern Area and Southern Area caves together. 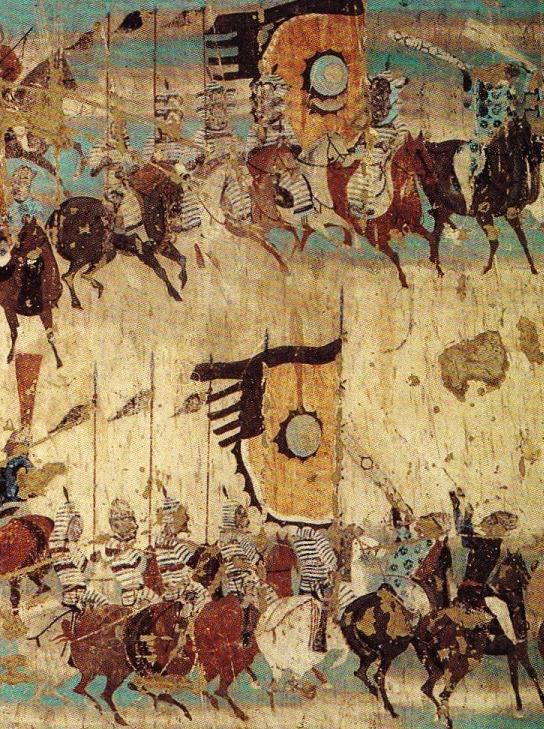 Detail of mural commemorating victory of General Zhang Yichao over the Tibetans. 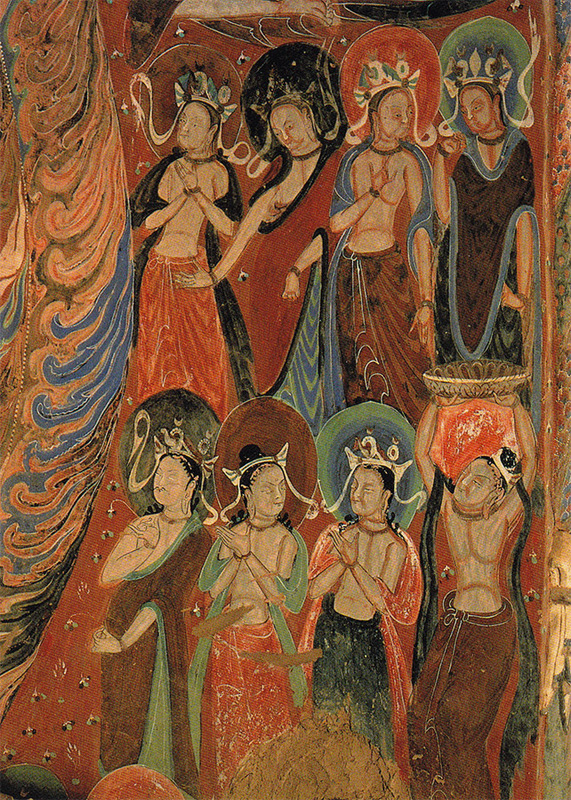 Dunhuang Mogao cave 156, Late Tang Dynasty. 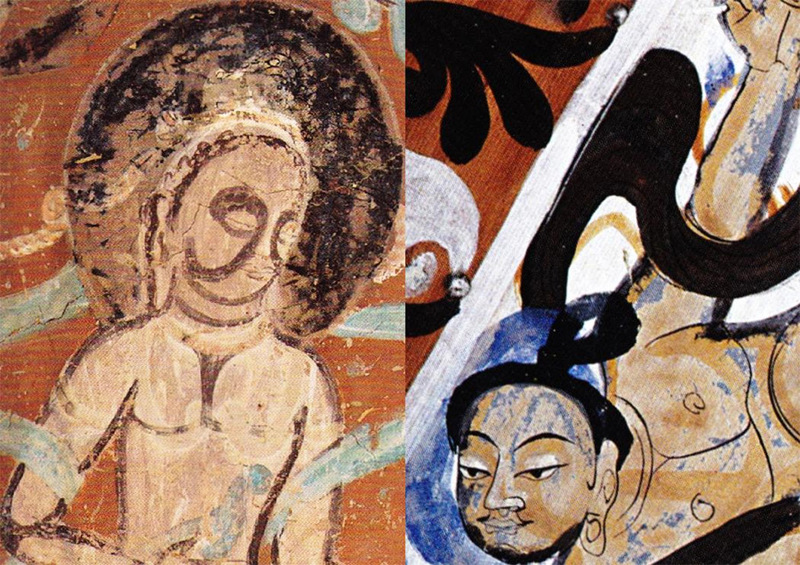 Dunhuang Mogao Caves, scanned from Cave Temples of Dunhuang: Art and History on the Silk Road. 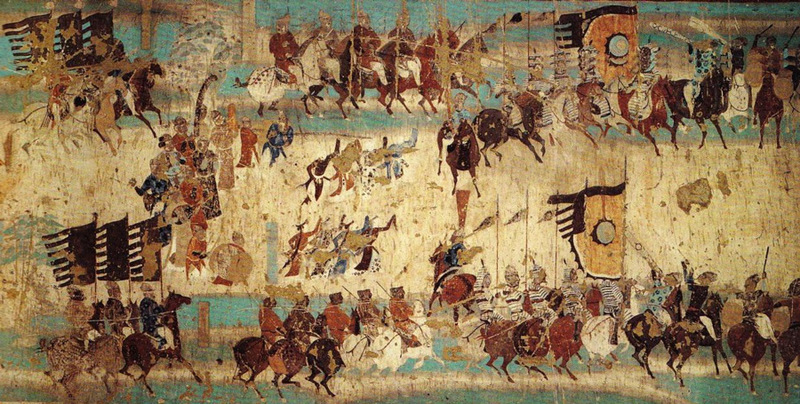 Section of mural depicting victory of general Zhang Yichao who expelled the Tibetan from Dunhuang. 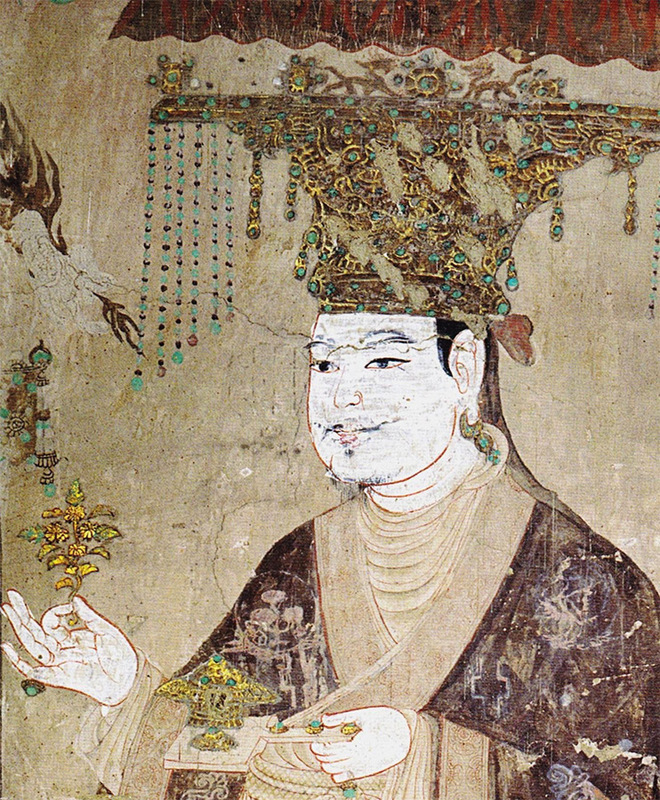 Cave 156, Late Tang Dynasty. Cave 285. 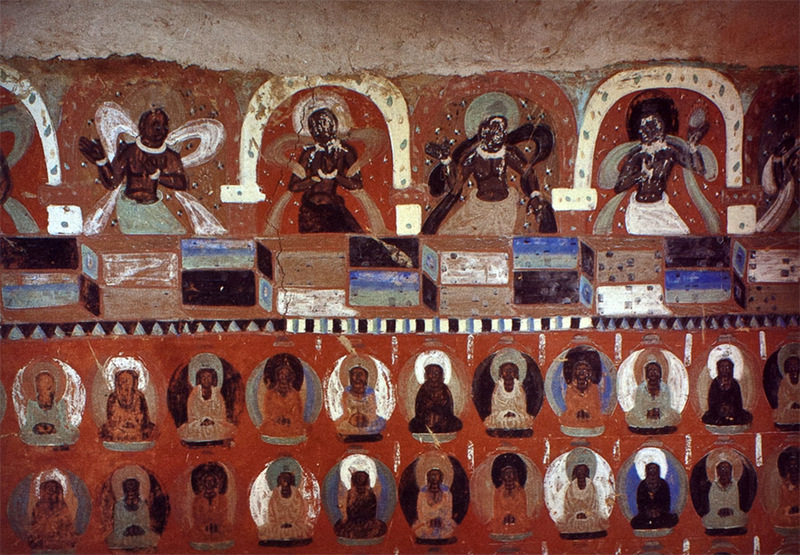 This is cave mural of Worshiping Bodhisattva. Wei Dynasty (535-556 A.D.). 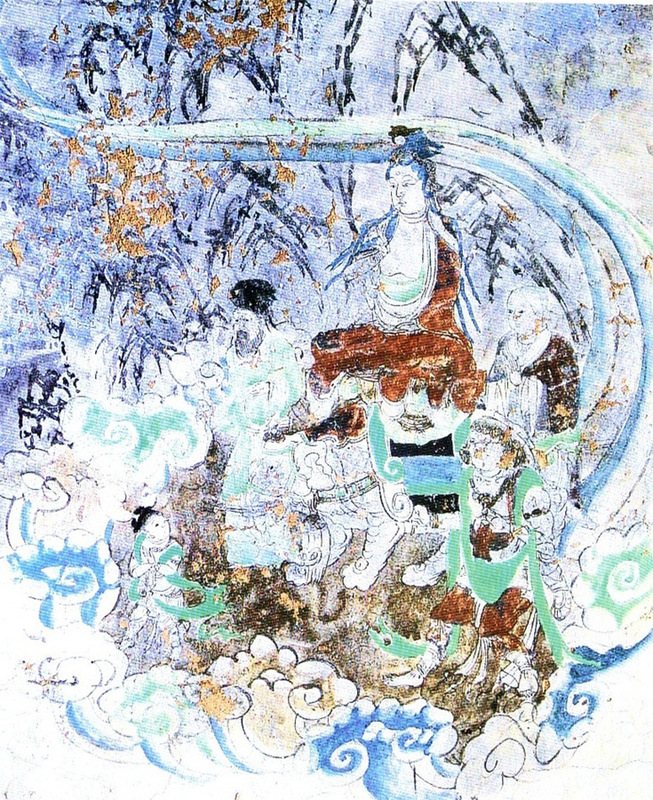 Vimalakirti in debate with the bodhisattva Manjusri, detail from a wall painting in Cave 103 of Dunhuang, Gansu province, China, dated to the Tang Dynasty, 8th century. 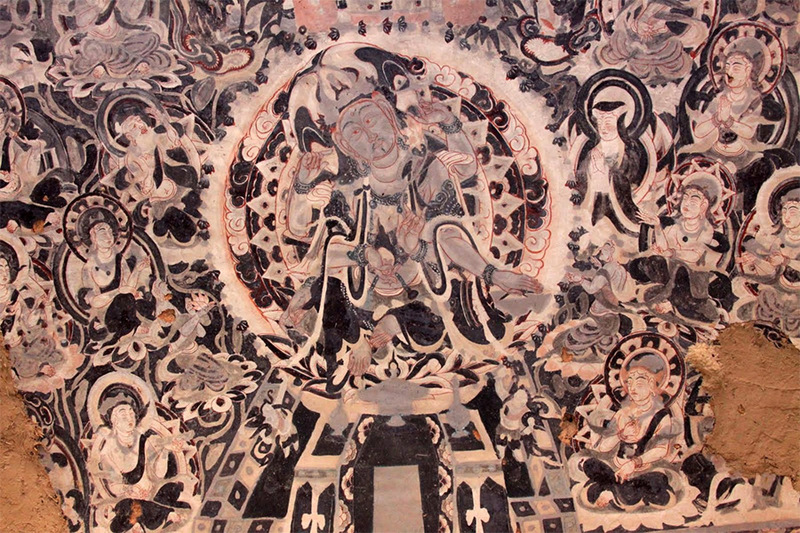 Chinese mural of a bodhisattva from Mogao Caves, Dunhuang, showing strong Central Asian influence, as well as the characteristics of Central Asian Mahayana Buddhism during this time. 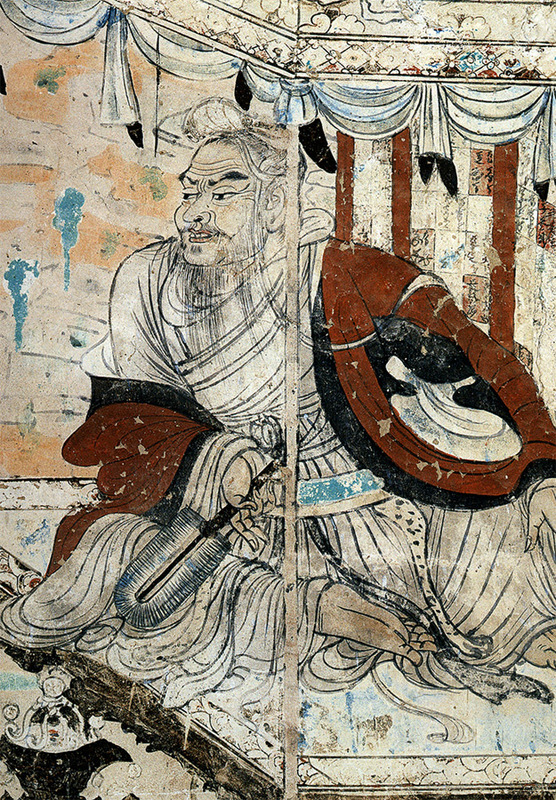 Murals details from Dunhuang showing shading techique. Figure on left from cave 275 from the Northern Liang period (397–460), figure on right from cave 428 from the Northern Zhou dynasty (557 – 581). Xuanzang returned from India. 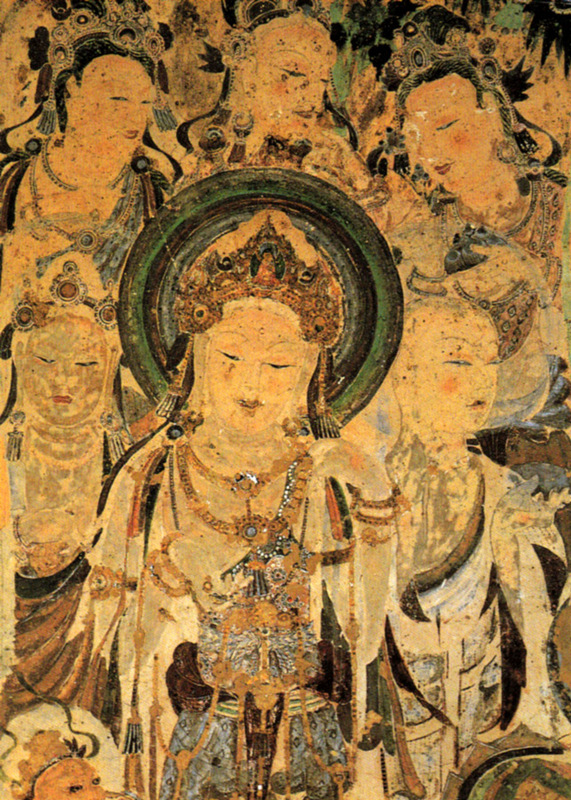 Dunhuang mural, Cave 103. High Tang period (712-765). 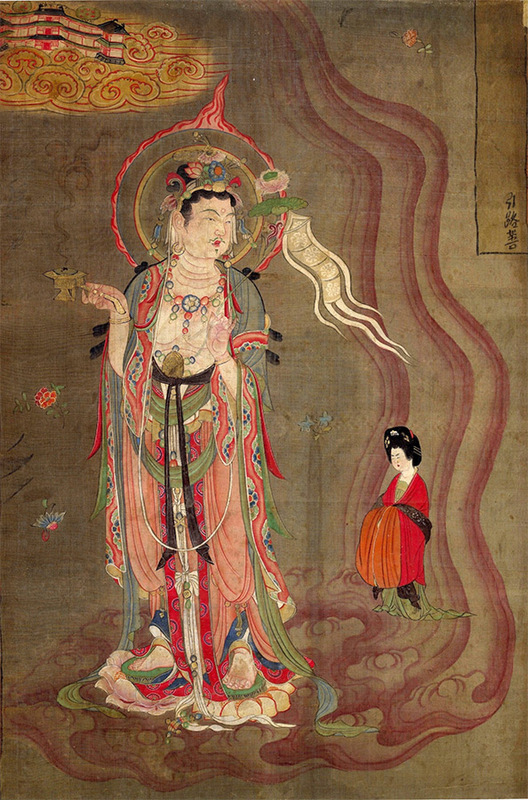 Bodhisattva Leading the Way, color on silk, 80.5 x 53.8 cm. The image was discovered at Dun Huang in the “1000 Buddha cave” (cave 17). 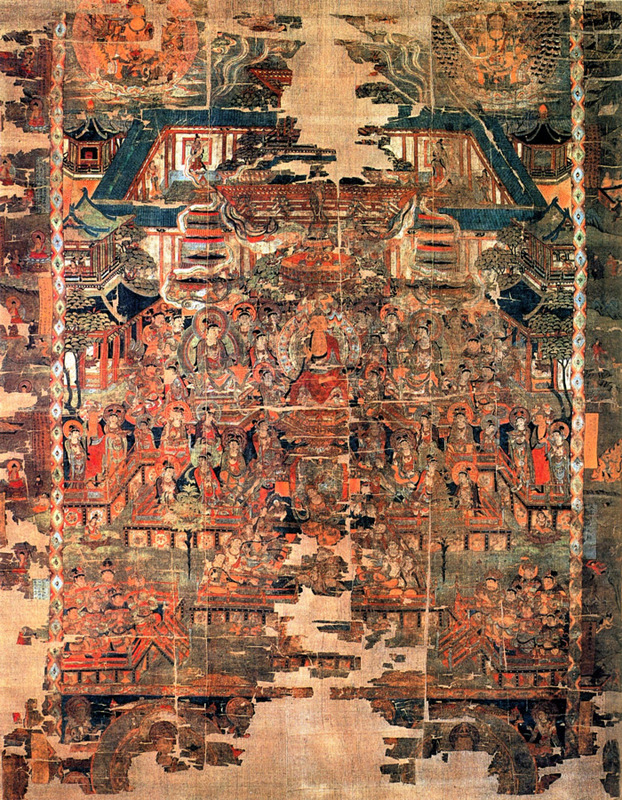 The bodhisattva is leading a woman to the Pure Land on the golden cloud in the upper left corner. His right hand contains an incense burner. His left hand contains a lotus flower. Located at the British Museum Department of Asia. Devas. 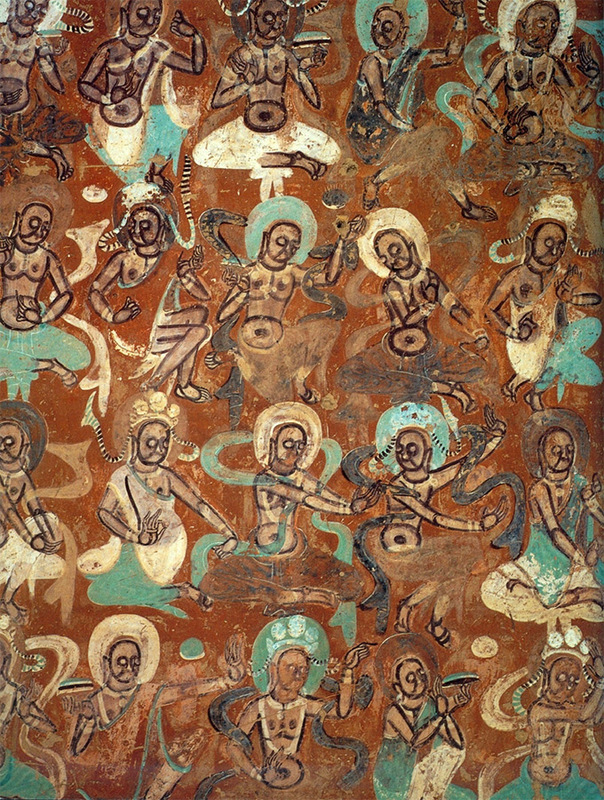 Dunhuang mural. Cave 272, Northern Liang dynasty.